When I watched this film for the first time back in 2011, I didn’t really know what was going on and or think much of it. However, watching it again recently, I quite enjoyed it and picked up on a lot of fairy tale references. I’m sure other people have blogged about this film and fairy tales before now, but whatever. I’m chucking my thoughts into the pot! Hanna is an action film directed by Joe Wright. It’s about a teenage girl, named Hanna, who lives with her father, Erik, in the snowy wilderness of Finland. Erik has trained her to be an assassin, and explains that when she wishes to leave home, she must flip a switch. This switch will send a signal to someone called Marissa Wiegler, who Hanna has been told by Erik that she must kill. Well, of course she flips the switch. Cue lots of fight scenes, running, murder, and uh… repeat that cycle several times. From watching that, it’s clear there’s a fairy tale theme going on here. Personally, I linked fairy tales to two aspects of the film: Family, and Hanna’s understanding of the world. Hanna’s birth mother is dead. I don’t need to tell anyone familiar with fairy tales that dead mothers are a common thing, and as a result, so are passive fathers and evil stepmothers. Think ‘Cinderella,’ ‘The Juniper Tree’ and ‘Hansel and Gretal.’ Hanna lives with her father, and although he teaches her all the assassin skills she could ever need, he fails to prepare her for what the world is like and how to interact with other people. Then he sends her off, leaving her without guidance and subject to danger. In the film’s climax, he can’t even protect her from Marissa – Hanna has to face the final battle alone. Marissa fits several fairy tale character archetypes. Sticking with the family theme, she can be seen as the evil stepmother. Especially since she killed Hanna’s mother because she wanted Hanna for herself — that’s going to extreme evil stepmother lengths! Marissa is possessive and determined. If she can’t have Hanna, then no-one else can. And Hanna makes it clear that she doesn’t want to be owned my Marissa (trying to kill her is a bit of a giveaway, who knew?) Marissa also fits the stepmother role because she had a hand in Hanna’s birth. Hanna was an experiment. Marissa’s company modified her DNA to make her stronger and more fearless — in other words, a perfect assassin. Which she is. The other two characters which parallel Marissa are the wolf and the witch. In Little Red Riding Hood, the wolf is a hunter. He makes a game out of reaching grandma’s house, and enjoys the chase. Marissa is similar in that she enjoys tracking Hanna and her father, and picking off their accomplices. When she finally catches up with Hanna, their final showdown takes place in an abandoned fairy tale-esque theme park (which is a real place in Berlin called Spreepark. Urban exploring, anyone?!) Marissa walks out of the mouth of a wolf to meet Hanna, reinforcing her fierce personality. I’m wondering why this wolf is even in a children’s theme park in the first place. It’s terrifying! Image from The Movie Club. As for the witch, after Hanna kills a body double of Marissa believing it to be her, she sends her father a postcard saying nothing but ‘the witch is dead.’ Joe Wright also said in an interview that he picked Marissa’s shoes for some scenes because they looked ‘witchy.’ Marissa is the antagonist of this film, as so many witches are in fairy tales. This is an easy link to make, and especially for Hanna who grew up in isolation with only an encyclopaedia and a book of Grimm’s tales to tell her about the outside world. Which brings me to Hanna’s understanding of the outside world. Hanna has a book of Grimm’s fairy tales, which she is seen reading from as a child and also just before leaving Finland. Fairy tales have a reputation for teaching children morals, but Hanna has a distinct lack of these implying that fairy tales alone are not enough to educate a child. Having had no contact with the outside world until she goes on the run, despite her ruthless assassin persona she is very innocent. Everything is strange to her, and she is curious and wants things she does not understand such as friends, music, and electricity. Hanna befriends Sophie, an English teenager travelling with her family. They are very different, but manage to get along. Image from Wired. Fairy tales often have coming-of-age themes, where characters go out into the world alone to seek their destiny. Like the mermaid who is restless and wants to see what is above the water, Hanna also wants to see what is beyond the snow. But they both learn that it’s not what they expected. Hanna can handle the assassin-y stuff fine, but boiling a kettle or going on a date? Not so easy. Like in a fairy tale, she must overcome these challenges to get her happy ending. In the woods: Hanna and Erik’s cabin is straight out of a fairy tale picture book. Image from Pushing Pixels, which has some great information about the set design of Hanna. It’s got everything – snow, quaint slanted roof, glowing windows, and is surrounded by a spooky forest. House where Hanna goes to meet a friend of Erik’s – whose name, oddly enough, is Mr. Grimm. Image from Worstist. Swan-shaped boats. Hanna and Marissa run across these. Image by Sebastian Niedlich on Flick River. 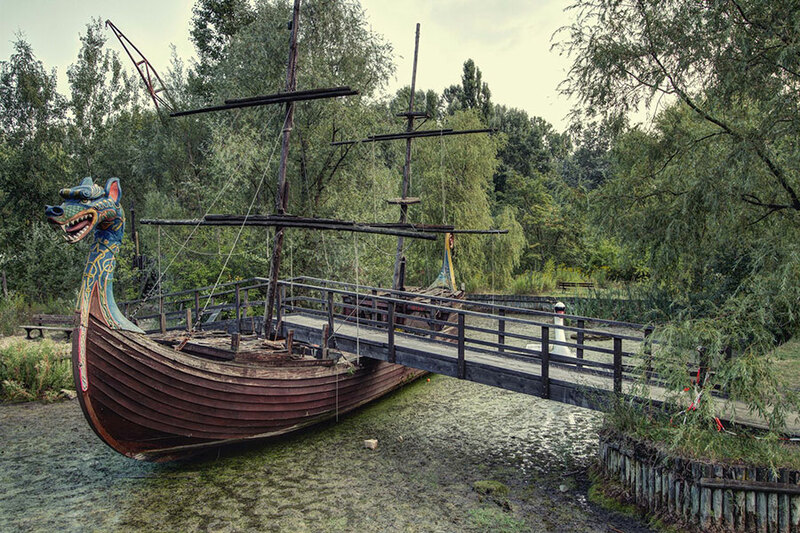 Abandoned pirate-style ship with a dragon’s head (and creepy swan in the background!) Image from Ceo World. Visually, Spreepark makes the atmosphere of Hanna very surreal. As a symbol, for me it feels like Hanna wants to go back to when her life was simple, when she was reading fairy tales, instead of living them. But now everything is broken and it’s too late for her to return. There’s a great article about the set design of Hanna here. Speaking of symbols, the final point I want to make about Hanna is the deer. The opening scene of the film is Hanna hunting a reindeer, and then near the end she sees a young deer in Spreepark. Again, deers are common creatures in fairy tales. For example, ‘Little Brother and Little Sister‘ and Andrew Lang’s ‘The Enchanted Deer.’ They also feature heavily in Scottish and Irish folklore. Deers are symbols of peace and innocence, as well as wisdom, strength, and sensitivity. In the snow, Hanna is the perfect hunter (also thought it would be nicer to have this picture than one of her with a dead deer…) Image from Plugged In. Here’s my interpretation: Hanna killing the reindeer at the beginning shows she is strong in that environment. She can take down one of the most powerful creatures that lives there. However, the small deer later on is almost like it’s taunting her. By this point, Hanna is weak and tired of chasing Marissa. In a new environment, she’s not so sure of herself. I already said that Hanna lacks morals, and she’s not the only one — even the ‘normal’ people in this film kill mercilessly. Given its symbolic meaning, it’s almost like the deer is standing in judgement. All the characters are one-dimensional, again similar to fairy tales, and so the deer is a reminder that this world lacks feeling. Overall, Hanna is undeniably a strange film. It grew on me second time around, and if you watch closely there’s a lot to read into (hence this blog post). Aesthetically, is’s very artsy and uses some interesting camera angles, so it’s good if you’re looking for something different regarding style. Also, Saoirse Ronan’s acting is flawless as ever. Joe Wright said he wanted to make a film that was a kind of fantasy, but not CGI, Hollywood fantasy. A lot of fairy tale films claim to be ‘dark’ and look adult and cutting-edge, but somehow manage to be none of these things. Hanna is the real deal. What did everyone else make of Hanna? Let me know in the comments!